Go do some research on Google and you will discover that 99% of the Salons you compete against offer their clients a discount if they come in on the day of their birthday. I don’t recommend you do that! A discount on the day of her birthday is not a compelling enough incentive to cause your customer to pick up the phone, make a booking and drive to your Salon. Your customers do not lie in bed at night and think, “I can’t wait for my Beauty Therapist to send me a discount for my birthday!” But, they do dream about being surprised, spoilt and swept off of their feet. There’s another reason why I don’t recommend giving a discount and it has to do with standing out of the crowd. If you want to succeed at business, if you want your marketing to stand out of the crowd then take a look at what everyone else is doing and do the opposite. 1. Choose services from your treatment menu that do not take long to deliver, thirty min or less. 2. Choose services that can be done at the same time. 3. 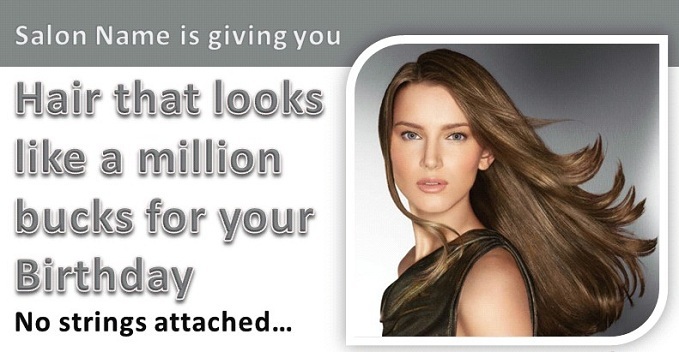 Choose services from your menu that do not cost your salon lots of money. 4. Choose services that are visual, i.e. They must be services where the client can see a visible before and after difference. She should walk in one way and walk out another. She is going out to dinner for her birthday so she must leave your salon looking good and knowing it. 5. Choose services that have great rebooking, crossell and upsell options. Make sure that your staff are trained and ready. Having said that, you may also want to create a pamper package for some of your customers. You may have some customers who are not interested in a makeover but they might be more interested in taking time out for a quick massage or pedi. Element 1. An attention grabbing headline that forces your customer to read through your entire promotion and book. Element 4. A clear, easy to follow call to action. If you don’t ask your customer to respond and book in she won’t do it. 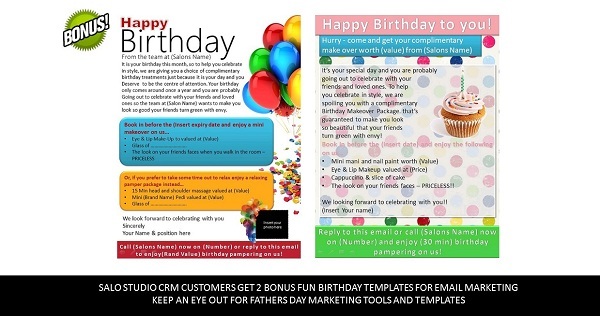 You can do all of this yourself but if you are a Salon Studio CRM customer you can go immediately to the Marketing Store inside of Salon Studio CRM and download 7 brand new, ready made birthday marketing promotions for hair, nails, make-up, massage and beauty. Customise them with your own offers, logo and contact details. Salon Management Studio is the only Spa and Salon Software in the world that offers you a complete marketing solution that will save you time, make you money and take the hard work and thinking out of marketing your salon. It is not just Salon Marketing Software, it is software with a built in professional marketing consultant. Check out the preview below of some of our latest ready made templates. I hope you have enjoyed this series on birthday marketing for spas and salons. If you have any questions or if you need any help marketing your business I would love to hear from you. P.S. Keep a look out for our Fathers Day Marketing tools coming soon! !